ProcArch Services provides consulting and process definition services for technology companies. CMMI©-DEV process definition is a specialty. Now Available! The first in Joseph McConnell's CMMI-DEV series, What Could Go Wrong?" 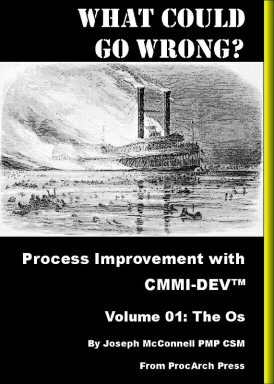 Published by ProcArch Press, the first of these eBooks presents the basics of process improvement with CMMI by looking at the risks of not doing it. Get it from Amazon in Kindle format here. Find out more about CMMI from Carnegie-Mellon University's Software Engineering Institute. Is CMMI compatible with Agile Methods? What do we mean, "Process Architecture?" You wouldn't launch a large-scale software system without considering how it's put together, would you? How about a hardware effort? Or a full-blown system of systems? Anything with multiple interacting elements needs some level of design and coordination when it's being put together, right? Otherwise, how will it be maintained and enhanced? How will you find root causes when problems occur? Your organization's processes -- the ways you do business -- are just such a system of systems. Marketing interacts with Development. Human Resources and Finance touch everything in the company. New employees need to find procedures, old hands need to improve processes. If your processes are allowed to emerge organically, you get the same results, eventually, as you get with unstructured development of products: spaghetti code, so to speak. Nobody can find the information they need, when they need it. And even if you can operate under those circumstances, many standards and models for process and quality improvement -- for example, CMMI and ISO-9001 -- require you to have a method for managing your processes. If you're going for one or more of these, start with an architectural assessment of your process repository. It will make things a lot easier, and we can help. 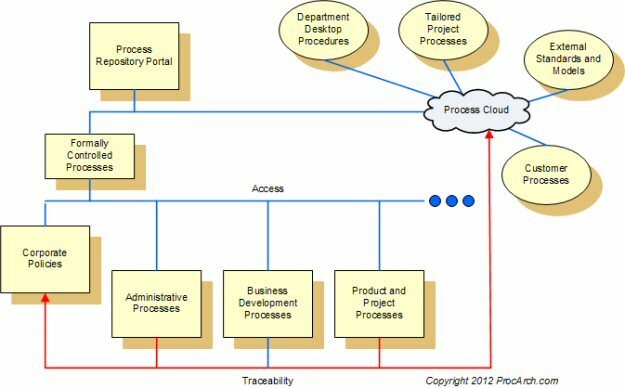 A simple process repository architecture might be set up allow access to all process information through a single portal. But the content would vary widely -- from formally controlled process descriptions to material under the sole control of a department, a project, a customer, or external agencies. And all your processes should be traceable to their source. Your HR processes, for example, should point back to the corporate policy that they comply with; likewise, they should be traceable to external sources. Traceability should let you easily answer the questions "Do we comply with this?" and "Why are we doing this?" Another obvious candidate for a repository is a structure for retaining process records -- the proof that you're doing business as your processes say you are. For example, you should make process change history and the records generated by process change control available from the portal. And it should also be possible to see the documents and records generated by projects and departments. And with traceability metadata in place, your repository becomes a central resource for proving compliance. "The external model says we need to be doing X, our processes say we do, and these records show that we're doing it." If you intend to reach and maintain compliance with external standards and models, you'll discover that audits and appraisals can be a substantial expense. A well-designed process architecture can cut down on the time it takes to prove you're doing things by the book.